It was the afternoon of opening day. Fred and I were headed east along an interior berm with water on both sides of us. Lola was hot, but she was all over the place. After leading us in what seemed like hot pursuit, she turned and headed back in the direction we came from. As I stood facing west, towards Lola, a rooster shot upward from ten feet to my right. I quickly swung and proceeded to unload my Beretta without touching the bird. Fred swung on it and missed his first two shots, but on the last shot, he broke a wing and the bird went down. Neither of us could see exactly where. Lola ran to a ditch and stopped. We didn’t know if the bird had made it across, but odds were it had. So, I lined Lola up and sent her. She climbed into the 25 foot wide ditch and swam across. When she reached the other side, her nose went into gear. Within 30 seconds she had scent and ran northward along the ditch as full speed. After about 50 yards she turned east and ran smack into the rooster. This is what makes pheasant hunting exciting. It was a thrill to see her in action. And, this was not her only impressive feat of the day. Earlier she had rooted a rooster out of tall fragmites and I dropped it, but as with the other bird, it landed on the other side of a ditch. She fought her way through the thick tules and found the bird on the opposite side, bringing it back. In all she raised five or six roosters and retrieved four that we downed. As a group, four of us came in with six birds. We did manage to lose a couple, but that’s not unusual in thick cover and wild birds. Since opening day, Lola and I have only been out once. The birds were much tougher, but we’ll be back out again this weekend to see if we can turn it around. It appears that the Mayberry hatch must have been pretty good last spring. We need a couple more good years of good spring weather to improve brood success and bring the pheasants back. 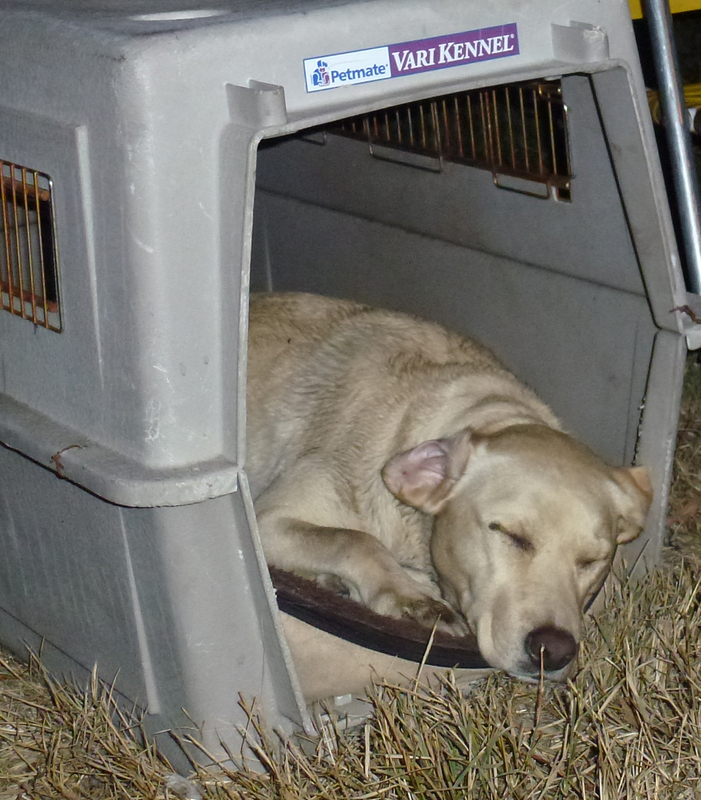 Lola earned her keep on opening day of pheasant season. It was one of those mornings when the birds were out. Maybe the moon phase or changing weather. 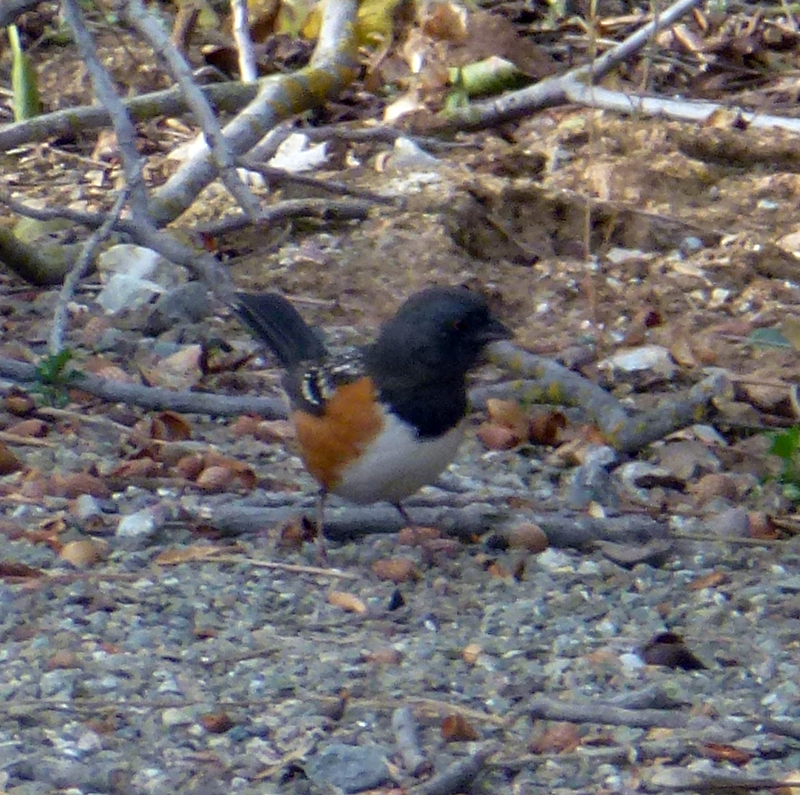 A towhee caught my eye, so I pulled out my small pentax camera and managed to get off a couple shots. This is the rufus-sided towhee. We also have the brown towhee and, inland, the green-tailed towhee. When he disappeared behind a car, I shifted my attention to a woodpecker in the tree above the towhee. I snapped a couple quick photos before he disappeared. 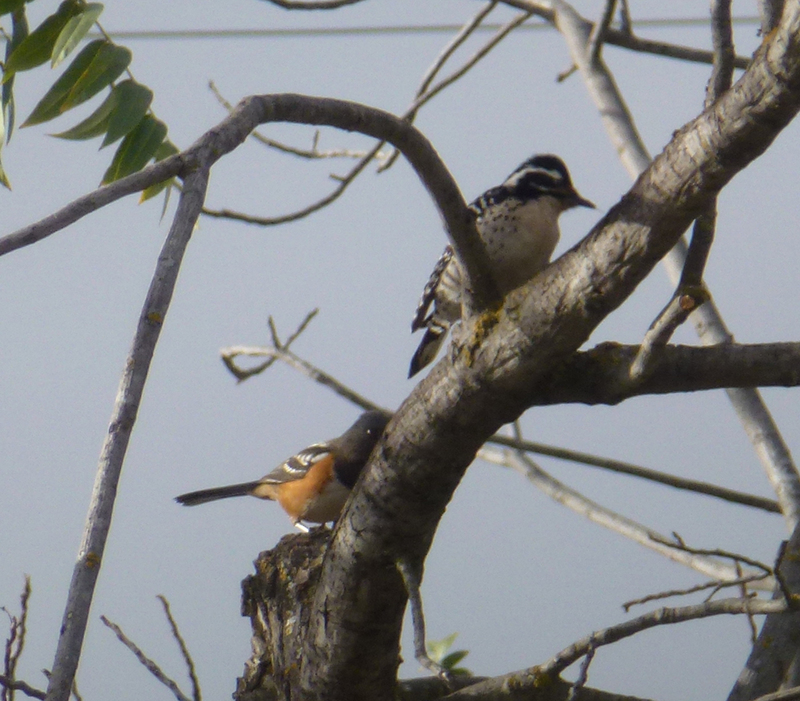 When I got home, I found that the towhee was in the photo with the woodpecker. I had taken his photo without knowing it. Here is the woodpecker. The woodpecker is a female Nuttal's woodpecker. First Rut for this Buck? 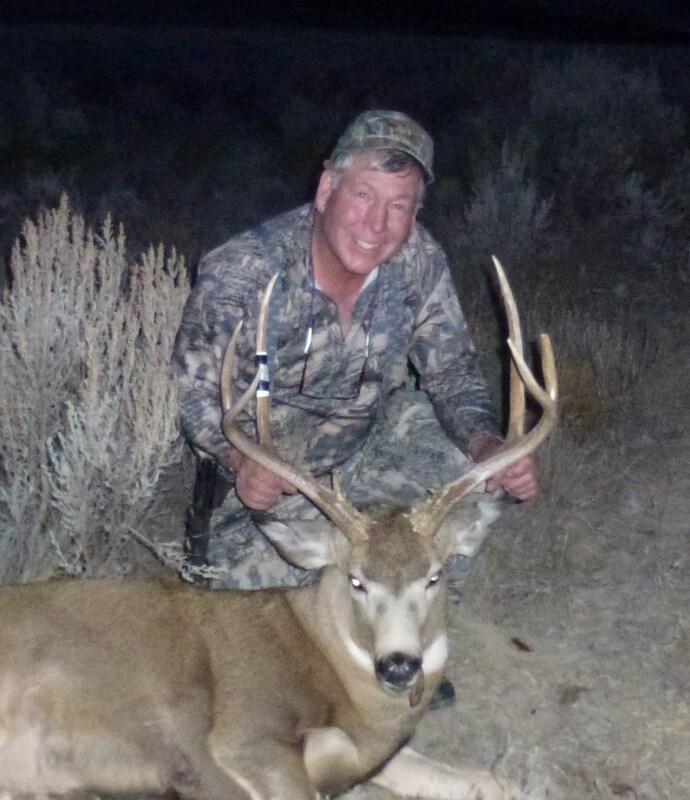 Sunday, Monday and Tuesday were filled with mule deer, but we didn’t find a no-brainer. We did find lots of mule deer and a few whitetails. I had the option of shooting a “trophy” buck or a management buck. 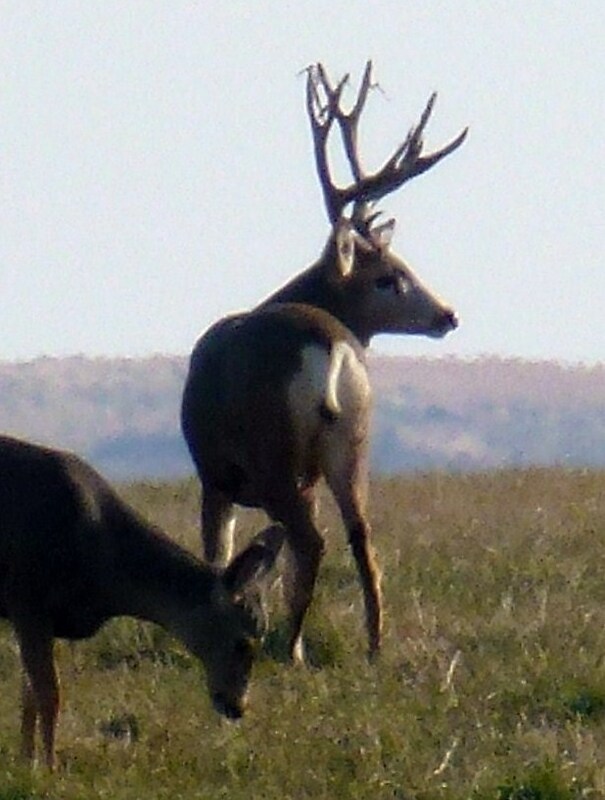 Here’s a trophy quality buck we observed and passed on. This guy was a great buck, but not a no-brainer.Saw this buck a couple times, but just couldn't get motivated. Am I crazy? No. I’ll come back for them next year or the year after. Saw this buck a couple times, but just couldn't quite get motivated. Maybe I should have taken the shot. This 2x2 was quite wide. Didn't get close to him. In the morning of the last day, we found a big 3×3 that the rancher wanted taken out. 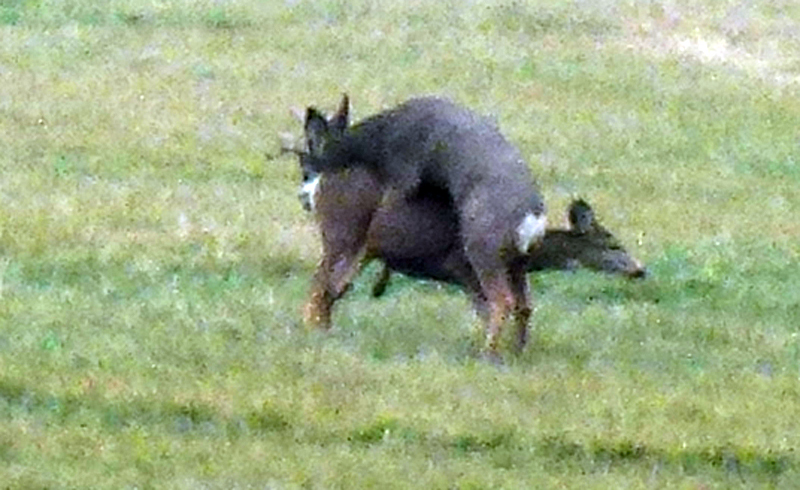 We didn’t get a shot at him, but watched as he bred a doe. We decided to take a different tack on him, but he evaded us. In the evening we came back and closed the deal as the sun set. 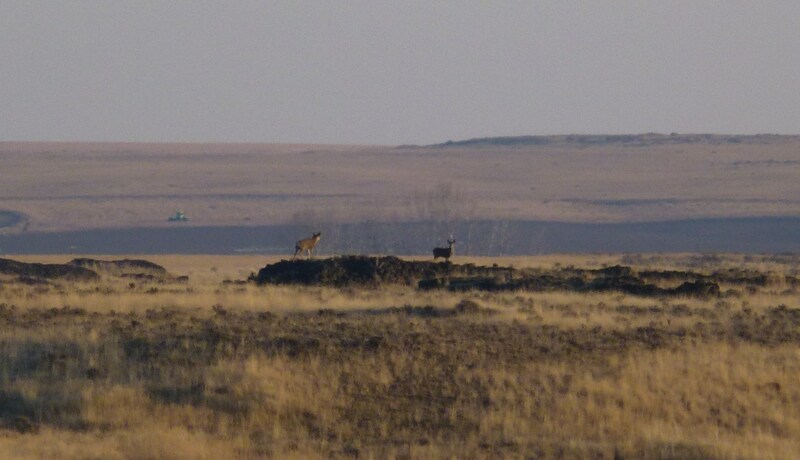 Here he is – probably a mule deer-whitetail cross. He qualified as a "management buck." From 250 yards, I missed on my first shot, but he gave me a second try and he dropped. After a couple minutes, he got back to his feet. The third shot put him down again. The bruiser was 23 wide and 19 high, a pretty good three point. I was happy and fulfilled by four days of mule deer watching. Taking home lots of venison. Couldn’t ask for more. 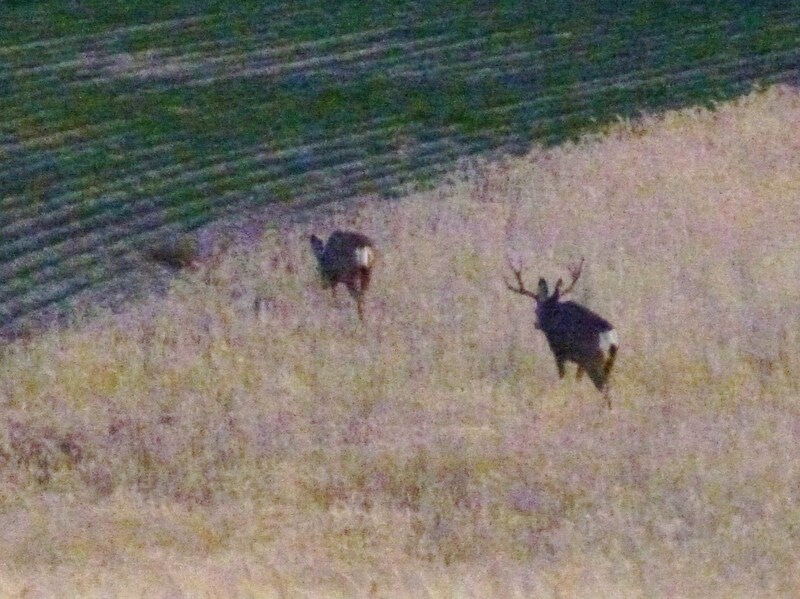 Looked at a lot of mule deer bucks the last two days – more four point bucks than I can recount. Not sure exactly how large the largest buck has been. Only one way to know that for sure. Hunting near Wilson Creek, Washington. Buck Run, the private ranch on which I’m hunting, is managed under a permit from the State of Washington. The 40 thousand acre property is primarily a wheat and hay farm, but a secondary product is great mule deer. This may be the best-managed mule deer ranch in North America. Food plots provide winter forage for over a thousand mule deer – resident and non-resident. Winter wheat provides green feed while two varieties of spring wheat provide food for the cold winter. 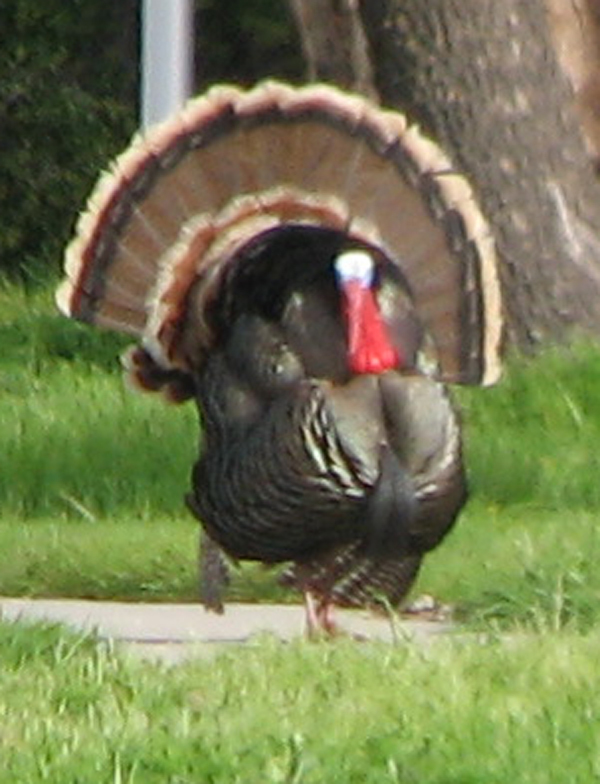 Guzzlers provide water for dry spells and supplemental grain feeding provides calories when the weather is bitter cold. Saw over 500 mule deer the last two days. Looking for one good one tomorrow.